Last update February 2018 Tip : You can now access this page by typing directly ancientdna.eu into your browser. You will find below the list of all ancient DNA from Europe for which an unambiguous mtDNA or Y-DNA haplogroup has been identified. Some bone samples were only tested for the HVR1 region of mtDNA, which does not always allow to clearly determine the haplogroup. Pioneering ancient DNA studies have also proven unreliable due to possible contamination from people handling the bones. All these results were discarded as they are useless and only bring confusion to the picture. Studies testing only the HVR-1 region of mtDNA also typically fail to deliver unambiguous results. NB : The age of ancient cultures is indicated in 'years before present', abbreviated as 'ybp'. Haplogroup R0 is also known as 'pre-HV' and is classified together with HV for facility as the frequently used HVR test does not permit to distinguish one from the other. Likewise HV0 and V are lumped together under V.
Solutrean Culture (22,000 to 17,000 ybp ; France, Spain): ? Note that the very late Mesolithic Pitted Ware culture (c. 3200–2300 BCE) in Sweden is listed separately as it is possible that intermarriages with Neolithic or Chalcolithic neighbours took place. Neolithic Britain (c. 6,000 to 4,500 ybp): H (x10), HV (x1), J (x6), K1 (x16), T2 (x5), U2 (x1), U5a (x3), U5b (x4), U8 (x1), V (x1), X2 (x2), W (x1). La Problematica del origen de los Iberos segun la secuencia genetica de los restos humanos, Domíngue Fernández (2005 - doctoral thesis). Chandler et al. (2005) recovered 8 mtDNA sequences from several Mesolithic sites from the Sado estuary in central Portugal, and identified 4 individuals belonging haplogroup H (including one H1b and one possible H7), 2 to haplogroup U (U4 and U5b1c2) and 2 to haplogroup N (probably N1b and N5). Their age range from 9,500 to 7,500 ybp. Delsate et al. (2009) analysed the mtDNA of the Reuland-Loschbour man (8,000 ybp) from Luxembourg and assigned him to haplogroup U5a. In 1996, Bryan Sykes of Oxford University first sequenced the mitochondrial DNA of the 9,000-year-old Cheddar Man from Gough's Cave in Cheddar (Somerset), England, and assigned him to haplogroup U5. Hervella et al. (2012) tested one mtDNA samples from Aizpea (Navarre) dated from 6,600 ybp, and found it to belong to haplogroup U5b1. Bramanti et al. (2009) tested Mesolithic remains from several locations across Europe, and found one haplogroup U5a (9,800 ybp) at the Chekalino site in the Volga-Ural region of Russia, one U5a1 (10,000 to 8,000 ybp) at the Lebyazhinka site in the Middle Volga region of Russia, one U5b2 (9,200 ybp) at the Falkensteiner Höhle cave in Baden-Württemberg, Germany, one U5a2a and one U5b2 (both 8,700 ybp) at the Hohlenstein-Stadel cave, in Baden-Württemberg, Germany, one U4 (8,850 ybp) at Bad Dürrenberg in Saxony-Anhalt, Germany, one U4 and one U5b2 (both 8350 ybp) from the Kunda Culture in Lithuania, two U5b2 (both 6450 ybp) from the Narva Culture in Lithuania, two U5b1 (6,000 to 5,000 ybp) from the Zedmar Culture in Poland and one U5a (4,250 ybp) from the Drestwo site in northeast Poland. Balanovsky et al. (2012) tested 19 ancient mtDNA sequences from Gotland, Sweden. They identified 8 individuals belonging haplogroup U4, 6 to haplogroup U5 (including three U5a), one to haplogroup V, one to haplogroup K, one to haplogroup T. No haplogroup could be attributed for the last 2 samples based on the HVR test alone (16311C). Malmström et al. (2009) tested 19 ancient mtDNA sequences from Gotland, Sweden. They identified 8 individuals belonging haplogroup U4, 6 to haplogroup U5 (including three U5a), one to haplogroup V, one to haplogroup K, one to haplogroup T. No haplogroup could be attributed for the last 2 samples based on the HVR test alone (16311C). Haak et al. (2005) and Haak et al. (2010) sequenced the mitochondrial DNA from several LBK sites in Germany and one in Austria dating from 5500 BCE to 4900 BCE. Out of the 38 mtDNA lineages recovered there were six haplogroup N (one N1a, one N1a1a, two N1a1a1, two N1a1a2, and one N1a1b), two U (U3 and U5a1a), seven K, four J, ten T (including three T2), three HV, eight H, two V, and two W. The Y-chromosomal DNA of three samples was also successfully retrieved and assigned to haplogroup F* (2 samples) and G2a3. Bramanti et al. (2008) tested the mtDNA from the LBK site of Vedrovice (5300 BCE) in the Czech Republic. Two samples were found to belong to haplogroup K, one to J1c, two to T2 and the last one to H.
Guba et al. (2011) analysed the mtDNA of 11 Neolithic skeletons from Hungary. Among the five specimens from the Kőrös culture (5500 BCE), two carried the mutations of haplogroup N9a and one of C5. Another one had a series of mutations not seen in any haplogroup to this day (16235G, 16261T, 16291T, 16293G, 16304C). The last one didn't have any mutation from the CRS in the HVS-I region and is therefore undetermined. Out of the six specimens from the LBK-related Alföld Culture (5250-5000 BCE) three belonged to haplogroup N (N1a, N1a1b, N9a), and one to haplogroup D1 or G1a1. The two others were undetermined (CRS and 16324C mutation reported as M/R24). Nikitin et al. (2010) studied the remains of the Eneolithic site of Verteba Cave (3600-2500 BCE) in Western Ukraine. They retrieved the mtDNA of seven individuals, which were assigned to haplogroup pre-HV, HV or V (2 samples), H (2 samples), J and T4. Chandler et al. (2005) sequenced the mtDNA of four Neolithic skeletons from the Impressed Ware Culture of Portugal (5500-4750 BCE), and found two members of haplogroup U (U and U5), one of H and one of V.
Lacan et al. (2011) tested 29 skeletons from a 5,000-year-old site in Treilles, Languedoc, France. Twenty paternal lineages (Y-DNA) were identified as G2a, while the two others belonged to haplogroup I2a. The maternal lineages (mtDNA) comprised six haplogroup U (including four U5 and one U5b1c), two K1a, six J1, two T2b, two HV0, six H (three H1 and three H3), one V, and four X2. The two I2a men belonged to mtDNA haplogroup H1 and H3. Lacan et al. 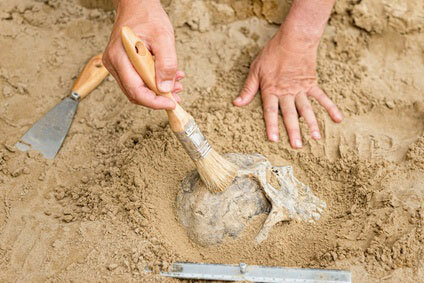 (2011 bis) tested 7 skeletons from a 7,000-year-old Neolithic site from the Avellaner Cave in Cogolls, Catalonia, Spain. Six paternal lineages (Y-DNA) were identified including five G2a and one E1b1b1a1b (E-V13). There were three mtDNA haplogroup K1a, two T2b, one H3, and one U5. The team of Fernández et al. (2006) and Gamba et al. (2008) analysed the mitochondrial HVR-I in 37 bone and teeth samples from 17 archaeological sites located around Castellón de la Plana, Valencia, Spain. Most of the results were inconclusive though. Out of the 12 mtDNA sequences from the Chalcolithic period that were retrieved, four were reported as haplogroup L3, four as H (including three CRS, which could be non-results), two to R0, HV or H, one to V, and one to D.
Gamba et al. (2011) identified the mtDNA of 10 Early Neolithic (5000-5500 BCE) samples from the sites of Can Sadurni and Chaves and three Late Early Neolithic (4250-3700 BCE) from Sant Pau del Camp, all around Barcelona, Spain. The coding region was also tested to confirm the haplogroups. The results included haplogroups N* (4 samples), H (4 samples including one H20), U5 (1 sample), K (3 samples) and X1 (1 sample). Deguilloux et al. (2010) examined skeletons from the Péré tumulus, a megalithic long mound (4200 BCE) in Brittany, and retrieved the mtDNA of three individuals. They belonged to haplogroup N1a, U5b and X2. Sampietro et al. (2007) analysed the HVRI mitochondrial DNA sequences of 11 Neolithic remains from the Cami de Can Grau site (3500 BCE) in Granollers, Catalonia, Spain. Four skeletons belonged to haplogroup H (including three CRS, which could be non-results), two to J, two to T2, one to U4, one to I1 and one to W1. In a study focusing mostly on the site of Tell Halula in Syria, Fernández et al. (2008) also tested two skeletons from the Nerja caves near Málaga, Andalusia, Spain. The first individual (3875 BCE) carried the mutations 16126C 16264T 16270T 16278T 16293G 16311C, and the second 16129A, 16264T, 16270T, 16278T, 16293G, 16311C. Both sequences could correspond either to haplogroup H11a (typical of Central Europe) or more probably L1b1 (found in the Canaries and Northwest Africa). In one pioneering ancient DNA study N. Izagirre and C. de la Rua (1999) of the University of the Basque Country, analysed the mtDNA variations in 121 dental samples from four Basque prehistoric sites. Among them, 61 samples from the late Neolithic site of San Juan Ante Portam Latinam (3300-3042 BCE) in Araba were found to belong to haplogroups H (23 samples), J (10 samples), U (11 samples), K (14 samples) and T or X (3 samples). The site of Pico Ramos (2790-2100 BCE) in Bizkaia yielded 24 results including haplogroups H (9 samples), J (4 samples), U (3 samples), K (4 samples) and T or X (4 samples). The site of Longar (2580-2450 BCE) in Nafarroa had 27 individuals H (11 samples), U (4 samples), K (6 samples), T or X (4 samples) and two other unidentified haplogroups. Finally, the site of Tres Montes in Navarra (2130 BCE) possessed 3 samples that appeared to belong to haplogroup L2 and two others that were undetermined (16224C and 16126C+16311C). The authors noted the conspicuous absence of haplogroup V, now present at a relatively high frequency among the Basques (6.5%). Fernández et al. (2005) tested the mtDNA of remains from the Abauntz site (2240 BCE) in Navarra. All three samples retrieved were inconclusive regarding the mitochondrial haplogroup. One sample was CRS (no mutation found). Another had 16126C+16311C, which would be R0a, HV0a or a subclade of H, among many other possibilities. The last one (16256T) could be H1x, H14 or even U5a. Hervella et al. (2012) tested 48 mtDNA samples from northern Spain dating from 6,185 to 5,160 ybp. Among the 41 Early Neolithic samples from Los Cascajos and Paternanbidea (Navarre), they observed 2 members of haplogroup H3 (or possibly H1a1), 8 H, HV or R0 (CRS), 4 other H, 1 HV, 1 U5, 8 U, 4 K, 2 J, 1 T2, 1 I and 1 X. Among the remaining seven Middle Neolithic samples, one from Marizulo (Gipuzkoa) belong to U5, while the six from Fuente Hoz (Alava) belonged to H (2, including one rCRS) and U (4 samples, including one U5a). Malmström et al. (2009) tested three mtDNA sequences from a megalithic site (3500-2500 BCE) in Gökhem, Sweden. They identified haplogroups H, J and T.
Bramanti et al. (2009) tested seven skeletal materials from Ostorf (3200-3000 BCE) in Mecklenburg-Vorpommern, Germany, and identified the haplogroups as U5 (3 samples including one U5a), K and T2e (2 samples) and J.
Melchior et al. (2010) managed to retrieve two mtDNA sequences from the Damsbo site (2200 BCE) in Denmark, which belonged to haplogroups U4 and U5a2a. Lee et al. (2012) retrieved the DNA of eight skeletons (6 in individual graves and 2 in double graves) in a cemetery located at Kromsdorf, Thuringia, Germany. The samples were dated between 2600 and 2500 BCE. Six mtDNA sequences were obtained and attributed to haplogroups U2e, U5a1, T1a, K1, I1 and W5a. The Y-DNA of two skeletons was also tested and assigned to haplogroup R1b (including one positive for M269, but negative for the Germanic S21/U106). Haak et al. (2008) extracted the mitochondrial DNA of 7 skeletal materials from a grave in Eulau (2,600 BCE). The remains belonged to mitochondrial haplogroups H, U5b, K1a2 and K1b (2 samples), I and X2. The Y-chromosomal DNA of two of the men was successfully extracted and found to belong to haplogroup R1a1. Kerri Brown of the University of Manchester retrieved the DNA from various bones of two Bronze Age skeletons from the Hebrides in Scotland, known as the Cladh Hallan mummies (1500 BCE). She explained that the mummies were made of body parts from several different people, arranged to look like one person. The mitochondrial DNA retrieved was reported on TV as H, U or U5, and probably T1. N. Izagirre and C. de la Rúa (1999) tested 6 Bronze-age mtDNA from the Basque site of Urratxa (circa 1450 BCE) in Bizkaia, Spain. They found two specimens belonging to haplogroups H, two to J and two to U.
Simon et al. (2011) retrieved the DNA from eight individuals in collective burials (circa 1200 BCE) at the Montanissell Cave in the Catalan pre-Pyrenees, Spain. The coding region was tested for two CRS results that turned out to be haplogroups U and J. They managed to assign four individuals to haplogroup J (three or all four probably J1c), two to haplogroup U (including one U5a1c), one to haplogroup K and the last one to haplogroup HV0 or V.
Hervella et al. (2012) tested 2 mtDNA samples from Urtiaga (Gipuzkoa), which were found to belong to haplogroups H, HV or R0 (rCRS) and U5a. Felix Schilz (2006), of the University of Göttingen, extracted the DNA of 34 skeletons from the Lichtenstein Cave (1,000 BCE) in the Harz mountains of central Germany. Using short tamdem repeats (STR) variances, 11 male individuals were assigned to Y-DNA haplogroup I2b2, two to haplogroup R1a and the last one to R1b. On the maternal side, 16 samples belonged to mitochondrial haplogroups H, 5 to haplogroup J (including one J1b1), 5 to haplogroup T2, 8 to haplogroup U (including five U5b and one possible U2). Melchior et al. (2010) recovered the mtDNA of a skeleton from Bredtoftegård site (circa 1400 BCE) in Denmark. He was identified as a member of haplogroups U4. Cardos et al. (2004) analysed the mitochondrial DNA from 5 Bronze-age individuals from Southeast Romania. Only a few HVR-1 mutations were successfully identified, which is not enough to determine unambiguously their haplogroups. The first specimen had the mutation 16129C. Assuming that no other HVR-1 mutation is missing due to incomplete sequencing or damaged DNA, this would fit haplogroup H17. The second individual had the mutations 16186T, 16189C and 16299T, which could be either H1a or H39 with two private mutations. The next person carried mutation 16129A and 16223T, which could also be haplogroup H1j or H17 with a private mutation, or even HV4a2 with 16221 missing. The fourth sample had only 16145A, which defines H22 with 16227 (it could therefore be "pre-H22"). The last sample had the common 16311C mutation, which if it is the only difference from the CRS would correspond to H2b, but is also found in subclades of H3, H6, H11, H13, and all subclades from HV6 to HV11. In conclusion, if all the HVR region was thoroughly tested and didn't miss any mutation (a big 'if'), then all the samples probably belonged to various subclades of H. However missing several mutations, they could belong to almost anything. Bouwman et al. (2008) tested the mitochondrial DNA of 22 skeletons from Grave Circle B at Mycenae (1,500 BCE). They only managed to identify 4 sequences, which belonged to haplogroups H (CRS), U5a1a, K (2 samples, probably brother and sister). The team of Caramelli et al. (2007) and Ghirotto et al. (2010) tested 23 HVR-1 mtDNA sequences from Bronze Age Sardinia (ranging from 1430 to 930 BCE) to compare them to modern Sardinian sequences. They found 11 ancient samples belonging probably to haplogroup H (including 6 CRS, which could ne non-result), one HV0 (reported as V), two U2 (or possibly H1a3), one J, three samples with the mutation 16129C that can correspond to H1j, H17 or possibly even U, and two samples with the mutation 16223T that do not permit to assign a haplogroup unambiguously. Nikitin et al. (2011) tested the mtDNA of remains from the Verteba Cave in central Ukraine. The first sample (circa 700 BCE) was attributed to haplogroup U5a1a. The second one (circa 750 BCE) matched the mutations for haplogroup H5a. Cardos et al. (2004) tested 4 bone remains from the Babadag Culture (1000-600 BCE) in Romania. Like for the Bronze-age samples, none of the results were conclusive though. One sample didn't have any HVR-1 mutation differing from the CRS. One sample had the mutations 16192T and 16284C. The two other samples both had 16262C, a mutation that isn't part of any known European or Middle Eastern haplogroup. Sampietro et al. (2005) tested the mtDNA of 17 skeletal remains from Iberian sites dating from 700 to 100 BCE scattered around Girona in Catalonia, Spain. To ascertain the haplogroups, the team analysed a few key mutations in the coding region in addition to the hypervariable section, and were able to determine that 9 individuals belonged to haplogroup H (including two H1), one R0, two J*, one T, three U (one U4, one U5 and one U5a), and one K.
The team of Fernández et al. (2006) and Gamba et al. (2008) analysed the mitochondrial HVR-I in 37 bone and teeth samples from 17 archaeological sites located around Castellón de la Plana, Valencia, Spain. Among the 8 mtDNA sequences from the Iron Age (700-500 BCE) that were retrieved, three individuals were reported as members of haplogroup H (all three CRS, so inconclusive), one V, one T1, one K, and two W.
Melchior et al. (2008a) analysed the mtDNA sequences of 7 skeletons from Bøgebjerggård (c. 2000 ybp), 6 from Simonsborg (c. 1900 ybp) and 11 from Skovgaarde (c. 1750 ybp), all in Denmark. They found 10 members of haplogroup H (including one H1), one V, one R0a, two J, one T2b, four U (one U2e, one U3a, one U5b, one U5b1), two K and three I.
Melchior et al. (2008b) sequenced 10 Viking skeletons from Galgedil in Denmark (c. 1000 ybp). They found 5 members of haplogroup H (including one H5a1g), one I, one K, one T2, four U5a1a, and one X2c. Naumann et al. (2013) tested the mtDNA of 9 Norwegian Norsemen from Flakstad in Norway (c. 1000 ybp) and reported five members of haplogroup H (including one H1a), two J (including one J1b1), one U4, and one U5a. Krzewińska et al. (2014) sequenced 43 Viking Age Norwegian skeletons from Hedmark, Nordland, Nord-Trøndelag, Oppland, Sør-Trøndelag, Telemark and Troms (c. 1000 ybp). They found 16 members of haplogroup H (including one H1b, H2a1 and one H6), two HV0, two HV (HV4a and HV9a), two I (including one I1), six J (including three J1 and one J1b1), four K (including one K1a11), one T2b, one U3a, one U4, seven U5 (including U5a and one U5b1b1), and one V.
Alt et al. (2014) analysed the DNA of 45 skeletons from a 6th-century Lombard cemetery at Szólád in Hungary, and managed to recover 24 mtDNA sequences. They found 8 members of haplogroup H (including one H1c1 and one H2a2b), two HV, two I3, four J (including one J1b1a and one J2b), two K, one N1a, one N1b2, two T2b (including one T2e), one U* and three U4. Vai et al. (2015) sequenced 102 Lombard skeletons from 5 burial sites in Northwestern Italy and successfully obtained 28 mitochondrial sequences. They found 14 members of haplogroup H (including one H2a2b1, three H2b, one H6a1b1 and two H24), one I2a, five J (including one J2a2c), three T (including two T2e), one U2e1, one U4, and three U5a (two U5a1b1e and one U5a2a). Tömöry et al. (2007) tested the mtDNA of 27 skeletons from 10th–11th-century Hungary. Neparáczki et al. (2016) sequenced 155 medieval Hungarian skeletons dating from the 9th and 10th centuries, covering the Avar and Magyar periods. Find out the latest studies and discuss them on the Ancient DNA Forum.